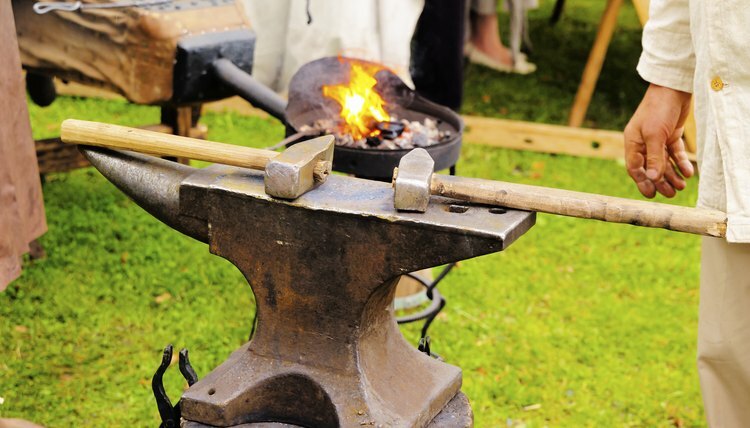 Blacksmithing -- a trade which many consider a dying art -- actually thrives in modern times as the choice of many artists, craftsmen and practical engineers. 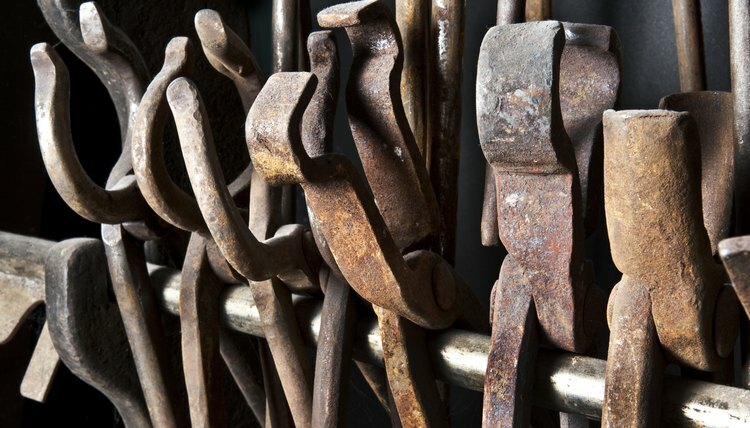 The mainstay tools that everyone knows -- hammer, anvil and forge -- are still the basics of the trade. While a beginner's kit may be small, from those basic tools and a stock of scrap steel a smith learns the secrets of making more tools. The blacksmith's forge in older times ran on hard anthracite coal or ordinary charcoal and was often fanned by an apprentice-powered bellows. Solitary smiths depended on hand-cranked blowers to intensify the fire. Antiques and old plans can still be found to outfit a shop in the old way, but other options abound. Some blacksmiths build forges from junk, while others invest in clean gas-fired furnaces. The quality of the fire is more important than looks or price. A good anvil is not just a necessity -- it's likely to be the smith's first major expense. Occasionally old anvils can still be purchased at auction, but a need for scrap steel during WWII used up most of this country's supply. New steel anvils are expensive because of the limited market and the expense of shipping, but are not difficult to find. Cast-iron anvils and small farrier's anvils are even more common but their potential is limited. A smith should buy the best, but even a section of railroad track lets you get started. There are no limits to the variety of hammers a smith will need, but a 2-pound ball peen starts your collection. Beginners should use a hammer light enough to control and move up to heavier tools as your strength and skill improve. A good general purpose hammer will have a wide and slightly convex face. Specialty hammers come in many shapes used for flattening, fullering and driving the many chisels and chasing in your toolbox. 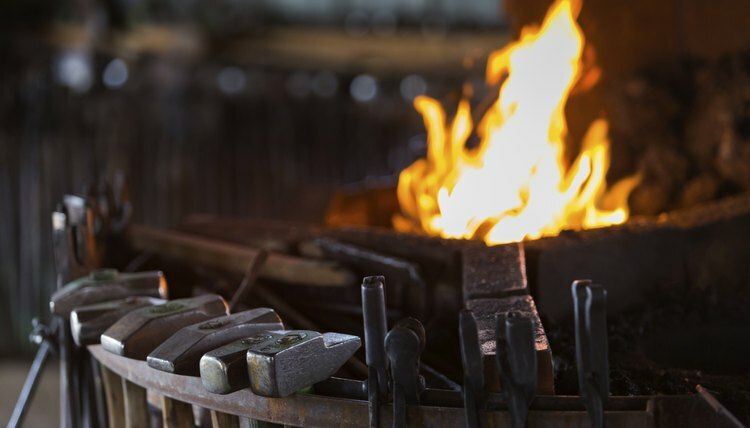 Working with hot steel requires many different types of tongs for holding the work securely on the anvil as it's forged. Special projects require tongs with flat jaws, narrow jaws and jaws with special purpose shapes for holding odd stock. 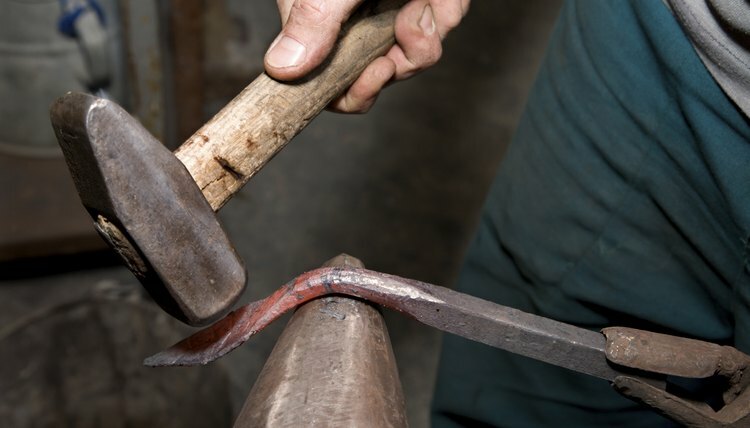 One of the first lessons in smithing should be how to make a good pair of blacksmith's tongs. Most smiths continue to make their own as needed. A complete shop needs much more than the basic tool set. So include a solid workbench, assorted hardies -- chisels or anvil blocks that fit the square socket in an anvil's face -- a stout blacksmith's vise, grinding and polishing wheels, measuring tools, saws and drills as you start your career. Most of a smith's tool set can be handmade, but buying advanced equipment like top and bottom swages -- used for shaping and straightening long stock -- or patterning tools for decorative imprinting might be wiser than trying to produce perfect work yourself. Young, James. "What Tools Does a Blacksmith Use?" 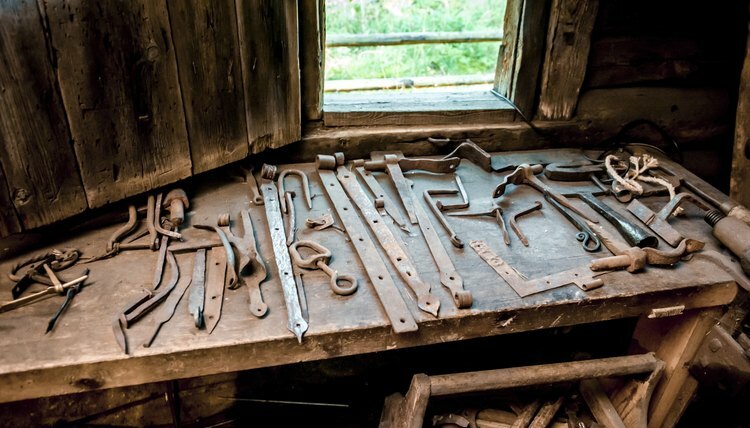 , https://careertrend.com/about-5325748-tools-blacksmith-use.html. 05 July 2017.